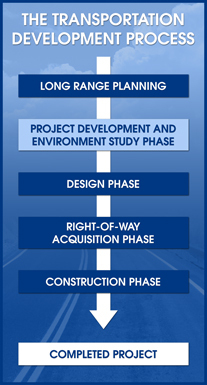 A Project Development and Environment (PD&E) study is a comprehensive study that evaluates social, economic and environmental effects associated with the proposed transportation improvements so that the FDOT can reach a decision on the type, location and conceptual design to meet the project’s proposed purpose and need. A No-Build Alternative, which considers leaving the roadway in its present state with routine maintenance, remains a viable alternative throughout the study. A State Environmental Impact Report (SEIR) is being prepared which summarizes the potential effects of the proposed project on the social, cultural, natural and physical environment. A PD&E study is required even if federal funds or permits are not needed. The Study would need to meet state requirements, which are similar to federal requirements, in analyzing the effects of the proposed improvements. The SEIR is signed by the FDOT District Secretary/ Delegated Authority or designee. If the study results in a Build Alternative selection, the project may proceed to the next phase, which is the Design Phase. Project Development and Environment Study (PD&E): During this step, design options and their social and environmental effects are examined. The US 41 project is in the PD&E study phase of the FDOT’s 5-step highway development process. A PD&E study assists the FDOT in determining the location, conceptual design and social, economic and environmental effects of the proposed improvement. During the PD&E study process, feasible alternatives are developed for roadway improvement projects. These “Build” alternatives are evaluated based on environmental, engineering and socioeconomic conditions, safety needs and public input. The need for additional right-of-way for stormwater treatment, floodplain compensation and environmental mitigation is also evaluated during the PD&E study phase. If the study results in a “Build” alternative being selected, the project may proceed to the next phase, which is the Project Design phase.